Heat maps are images of your web page or blog post that display where visitors have clicked or hovered on the page. They can show you the links and images that have interested people most, and also those areas of your page where they have shown little or no interest. Using heat maps to improve your conversions is as important to you as the design of the entire page itself. 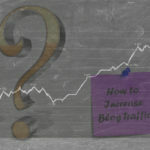 Google Analytics can give you a lot of traffic information, but it doesn’t tell why your visitors are leaving your website or blog. Heat mapping software not only offers this information, but also suggests where you can place adverts and links to make best use of the visitors to your site. While it is interesting to find out what parts of your page people are most interested in, there is little point in knowing this if you do not use that information in a productive way. We shall first discuss some general ways in which this type of information can be used, then examine some specifics in more detail. Finally, we shall discuss some heat map software you can use to get started. Use the information it provides, don’t just regard it as interesting. This is a very powerful tool giving you an insight into how visitors look at your website. Identify colors that people tend to like, and design your ‘call to action’ buttons in these colours. Check out the areas of your page that people tend to hover over and take note of the elements in these positions. Use the information from your heat maps to establish where best to place your adverts: check the results of this in your conversion rates and in new heat maps. Use heat mapping to establish how adverts and links differ in their popularity. Test text on your buttons: do people click more on ‘Buy Now’ or on the product name. Test fonts – do people react better to specific fonts on your page, and do they tend to react better to bold text or to italics – or to both? If you have a vertical navigation bar, do visitors tend to look just towards the top or do they scan all the way down? Use this information for siting your most important links. Repeat this with a horizontal navbar. Do left or right-hand links get most attention? 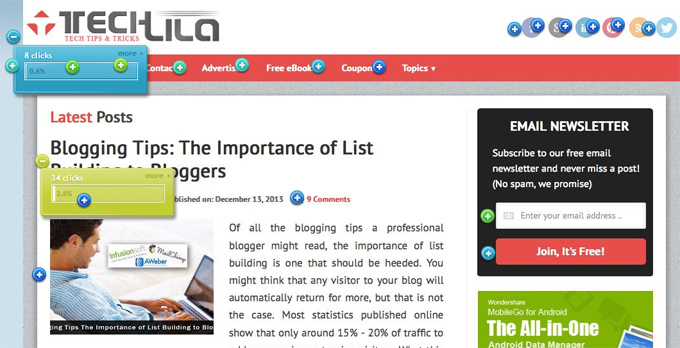 Switch the links around as a test to find whether people react to the links/adverts or to the placement on the page. What elements of text do people tend to hover on – can you use these as contextual links to sales pages or adverts? If you do this, does the interest in these areas of your page increase or drop off? These are just a few examples of how you can use heat mapping to make the best possible use of the geography of your web page or blog posts. We shall now examine some of these in more detail. 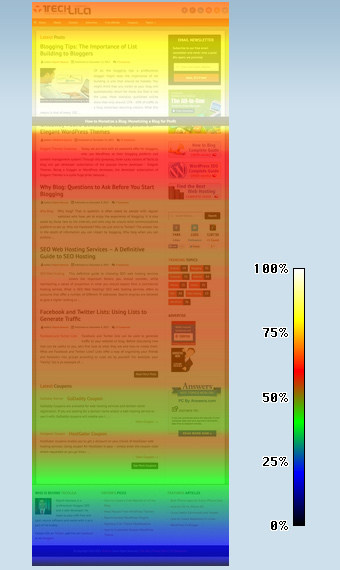 A heat map can provide you with useful information about the individual pages on your website. By mapping each individual page, or each page and post on your blog, you can identify the various distractions that take your visitors’ eyes away from your adverts, links and calls to action. If your site is based upon a general template, which the vast majority of websites and blogs are, then each page should be consistent in the hot spots relating to the template (headers, footers, navbars, menus, etc.). You can then establish the effect that your text has on your visitors. Compare the heat maps of various pages or posts and check out they differ. Popular or interesting content will have more hotspots than those that people find relatively uninteresting to them. If a page has poor content, visitors will likely be more interested in your navigation links than in the text on the page. You can, however, check whether or not they immediately leave the page or if they click on any adverts first. This gives you useful information on how to improve that page to retain their interest. By establishing the keywords that most interest your visitors you can maximize your use of such text on your web page and blog. For example, keyword analysis may have indicated that most people search for the term ‘heat maps’ than ‘heat mapping’. However, if you find that more of your visitors hover around instances of ‘heat mapping’ then perhaps you should use that term on your sales pages. Heat mapping is an extremely useful tool that can take the guesswork away from deciding on the text for your sales buttons or links to your sales page or squeeze page. Simply use each term in the text of your page and analyze which gets most interest. Now switch their positions around then carry out the same test to make sure that the difference was not due to the geography of the keywords – where they were respectively situated. Such tests can take time, but the results are well worth it. How much time is it worth you spending to find out the most profitable keywords to use in the critical areas of your content and sales pages? Not just the keywords, but also their positioning! 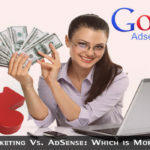 Your objective might be to get people to click on your paid adverts, your Adsense blocks, the links to your sale pages, or even on the ‘Buy Now’ button itself. Whatever form your call to action takes, it should be stated clearly using keywords that people react to and the color they appear to like. You should have read enough by now to understand how these parameters can be established and optimized on your information and sales pages. If you can use a combination of popular text and popular colors, then you should not only be able to drive more people to click on your adverts or visit your sales pages, but also to get improved conversions with your optimized buttons. If you find that more people click on red buttons than on yellow or green buttons, then change your sales buttons to red. If more people respond to the call to action ‘Buy Now’ than to ‘Click Here’ then use that text. You could even use heat maps to test yellow text on a red button, or red text on a yellow button. Use them side by side, and find which is used most. Most people have links on their sites that are rarely used by visitors, and in some cases are never used. It is useful to be able to identify these, and heat maps are the best way to do this. Sure, you can measure your traffic to each page, but how do you know what link these visitors used to get there? By heat mapping each page on your website and on each blog post, you can identify the pages and links from which people have reached each page on your site. By definition, therefore, you can also identify those links on each page that are never used. So why have them there? You might think it doesn’t matter, but it does. It affects your link-passing authority. The ‘link juice’ that each page on your site passes on is reduced for each outgoing link on that page. If 25% of your links are never clicked on, then 25% of your ‘link juice’ is being wasted. By identifying and removing links that people never use, you are improving your own internal SEO and also the benefit to others that your page is linking to. Clickheat is an open source heat mapping application, and so is completely free to use. It is also fairly basic, and it is important to read the instructions before using it. However, it is a very good free way to generate heat maps, and is an excellent introduction to the subject. Cannoli is another free heat map generator currently available from Github. It uses statistics generated by Ruwa (Ruby on Rails web analytics) and clicks are saved on a database for analysis. The heat map is rapidly generated for each page in C++. Like the above, this is an entry level heat map generator that may be sufficient for most amateur and hobby sites. It is also suitable for those that want to understand how heat mapping works before deciding to test a more commercial application prior to paying. ClickTale is the best of the free services, although there is an optional Premium Plan that offers up to millions of pageviews/month. 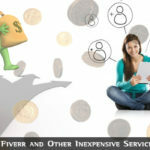 The free service offers 5,000 recorded page views/month. It can be operated from desktop and mobile devices. The free ClickTale version offers you more than either of the above two services, and is more suited to professional bloggers and webmasters than to smaller sites. See the Pro version below for the information it offers. The following offers a free trial for a limited period prior to you taking a paid account. Heat map: Where people click on your page. You can leverage the more popular links and work on those less popular. Scrollmap: How far down visitors scroll and where they leave your page. This helps you decide where you should place your most important links and calls to action. This is very useful on long sales pages. Overlay tool: Call it up to show you the number of clicks on each element of your page. Confetti: All the clicks on your site shown on one page by segment and referral source. You can see all your call to action buttons and anchor text and how many clicks each is receiving. Fix bad performers and leverage those that are working well for you. You can get a 30-day free trial of any level of service, from the $9 to the $99/month service. Nothing is billed until the 30 days are up, and if you wish to continue you are billed for one full year. They don’t advertise monthly terms, but there’s no harm in asking. c) An In-Depth analysis that informs you why they are visiting your page. You pay for these services, and their prices range. This is a professional heat mapping service that claims to offers more information than is possible from Crazy Egg. Prior to registering with ClickTale you are recommended to contact them via the excellent online chat service they offer, by service form or by telephone. The company will discuss your needs with you and come up the best service suited to your requirements. Among ClickTale clients are Sky, BT, T-Mobile, Time Life, Suncorp, PokerStars, Greenpeace and over 80,000 other online brands. You are in good hands with a service that has proved itself countless times. Heat maps offer more information to you than most people realize. Heat mapping is a very important tool to all progressive online companies, and for a large online firm to ignore them would not only be crazy, but would constitute professional negligence. The information they provide will enable you to maximize the potential of your website. You can leverage the most popular areas of your site, and make sure that your important information and clickable links are right there where they should be. Heat maps are not a gimmick, as they once may have been, but are now an essential online tool. 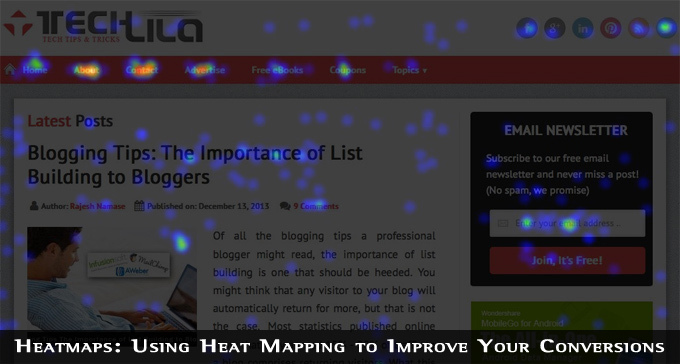 Heat mapping is used by virtually all successful online businesses and bloggers, whether they are hobby sites or large commercial enterprises.